Indicate light for power and carbon brush replace ETL security certification. UL certificate Double insulation protection system. 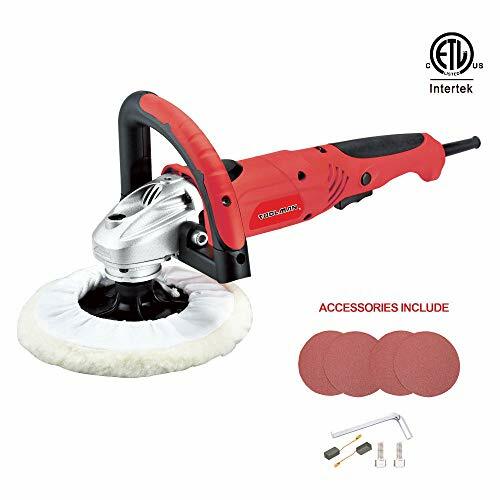 Self adhesive slip polishing wheel Specification: Rated voltage: 120 V/60 Hz Rated Amp: 7.2A Die cast aluminum head Heat treated precision cut gears High impact housing All ball bearings Spindle (Arbor): 5/8""-11TPI Ideal speed: 1000-2000 RPM for use with standard liquid polishes Ideal speed: 2300-3000 RPM for use with high speed standard liquid polishes Package included: Buffer Disc--1pc Free sandpaper--4 pc ( 80 grit *2 + 150 grit*2) anti-wool polish pad--1pc hex wrench--1pc Carbon brushes -- 1pair"
If you have any questions about this product by TOOLSMAN, contact us by completing and submitting the form below. If you are looking for a specif part number, please include it with your message.